There are lots of ways to show your Pirate Pride! Whether you put a Seton Hall decal on your car, hang your diploma in your office, wave a Pirate flag at home or share your love for the University with others, you're helping to support Seton Hall! 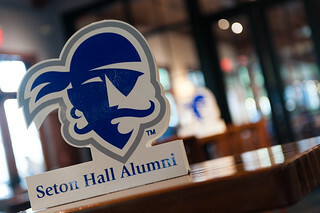 Seton Hall wants to make sure that you have the tools you need to show your Pirate Pride! All alumni are eligible to receive a free Pirate Pride Bandana. Haven't received your free bandana? Use our form to request one. No matter how you choose to display your Pirate Pride, be sure to let us know! You can send a photo to alumni@shu.edu or use that e-mail address to share the unique ways that you promote Seton Hall. If you're sending a photo - Please include the location and date if possible, and identify everyone in your photos. Note that we will not print names of anyone pictured who is under 18 years of age. Remember, showing your Pirate Pride is one of the four criteria for achieving True Blue membership each year, so be sure to tell us each time you let your blue shine through!